Philippines - President Benigno Aquino III final State of the Nation Address (SONA) is set to be delivered on Monday, July 27, 2015. According to the National Capital Region Police Office, they're deploying a 8,700 policemen to assure the security of the area and they will imposes a no-leave policy for its 18,000 personnel during the SONA 2015. Aside from the security of the areas, the Department of Education (DepEd) also announced the suspensions of classes to the affected schools in Quezon City due to traffic congestion. When our President start delivering its 6th State of the Nation Address, it also marks the beginning of a new regular session in Congress. The 6th and final State of the Nation Address of the President Benigno Aquino III is our topic here and we will guide you in writing your reaction paper for SONA 2015. Do you know that reaction paper is also known as "response papers." Your Instructor or Professor will ask you to write about the SONA 2015. And this is how you'll start doing it. First! you need to create a questions regarding your topic. Some questions are listed below so you could begin creating your reaction paper. But anything else, you must watch and hear carefully the State of the Nation Address 2015 so you could answers all of these questions. How do you react about SONA 2015? Has the president fulfilled his promises? What do you agree or disagree with PNoy SONA? Please identify the given situation involved in SONA 2015? What would be the best way to evaluate the SONA 2015? Then list all the 2015 SONA highlights in your reaction paper, usually these are the promises, plans, projects and so on, that the President will say in his SONA. Now! here you can do to your reaction paper introductions. President Benigno S. Aquino III begin his Sixth and last State of the Nation Address by saying an apology to his countrymen due to his conditions. During the SONA, the President was not feeling well that's why he did not do the traditional processional walks. But he still acknowledge the presence of his fellow politicians and members of the congress and all the audiences including the past presidents. Then after this sample reaction paper introductions, you can do listing all the major topic he discussed during his SONA. As I said before, you need to watch his 6th SONA so that you list down all the highlights he mentioned during the SONA. You can used the reference links below, if you would like to know more about the SONA 2015. It will give you more convenient if you save or bookmark this page now. Please save this page because we're gonna update this on Monday, July 27, 2015 after the SONA 2015. Here's the reference links for SONA 2015. Again! 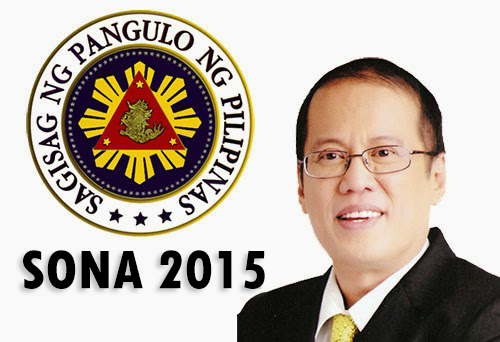 for more information about the SONA 2015, kindly bookmark this page and share to your joined social networking sites. Comments or suggestions about "PNoy SONA 2015: Guide to your Reaction Paper for SONA" is important to us, you may share it by using the comment box below.